Can anyone deny the fact that B2B ecommerce is a complex setup? Naturally then, the goals of B2B enterprise are also quite different from its B2C counterpart. Unlike the B2C model which operates with large number of customers having small ticket sizes, B2B works with a smaller set of clients who purchase in large volume. The success of a wholesale business relies on maintaining strong and long term partnerships with its clients. Hence, when a wholesale business is converted into an online store the most important thing to consider is the overall convenience of the clients. This can be made possible only when the B2B ecommerce website focuses more on the usability aspect of the store. To scale new heights of success the focus of the B2B ecommerce website should be on creating a seamless shopping experience for its customers. In the offline environment, these customers are used to having a special manager who acts as an agent between their team and the wholesaler. This person handles the various nuances of negotiations, discounts and finally helps in closing the deal. When these clients move to the online environment the above ambience should be replicated to make them feel at home. As the products are usually purchased in bulk there should be easy to search catalogues and categories where the client can fill in the desired quantity. The B2B ecommerce platforms should offer strong navigation tools, hierarchical categories, catalogues etc. They should also offer special forms on the site wherein the exact requirements of the clients can be gathered and custom offer can be made to them.These sites should also have a strong multi-channel support mechanism in form of live chat, email, SMS, browser and mobile notifications etc. so they do not miss the preferential treatment they were offered in the offline environment. Given the size and nature of business it is obvious that a wholesale setup needs more efficient payment channels than a regular B2C ecommerce website. In the context of B2B payments, just offering multiple choices to the clients is not sufficient. 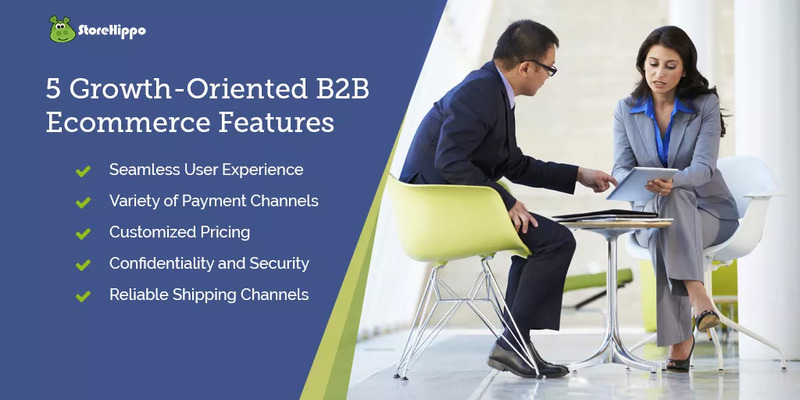 The B2B ecommerce solutions should offer flexible payment solutions to their clients that can adapt to their unique needs. Along with offering a host of national and international payment gateways there should also be support for bank transfers, credit and debit card payments, offline payments, COD etc. Including adaptive payments and customized checkout flow can also make it easier for both the parties to carry out transactions for bulk purchases. The payment gateways integrated for a B2B ecommerce business should be easily adaptable to the needs of the parties involved. The security net of these payment channels should be very strong so that it gives the vendors the confidence to do business with new and unknown clients. Also, the collection of funds should be fast and hassle-free. Pricing is a key factor in the success of any business, more so for a wholesale business. B2B pricing is a critical and sensitive factor as it cannot be uniform for all clients like the B2C environment. B2B businesses have dynamic pricing which is fixed as per the order volume and relationships with any given client. Successful B2B ecommerce platforms should offer the feature of personalized pricing which allows the wholesaler to adjust prices and make special deals to each and every client. Also, there should be the functionality to offer a certain pricing to a segmented customer group. Suppose a wholesaler is targeting a new foreign market. To attract the clients from this market the wholesaler might want to offer a specific discount. The platform should be able to handle this kind of location or customer segment based pricing. Pricing can be really complex in a wholesale setup and can have a variety of use cases. Apart from bulk-pricing a successful wholesale business should also have the options for retail pricing, minimum order quantity, pricing overrides where price changes based on client login and some other unique scenarios. The B2B ecommerce platforms that offer features to tweak pricing give a definite winning edge to a wholesale business. Confidentiality is of great importance in any business environment and even more in a wholesale setup. Unlike B2C there are more than one people involved in a typical B2B order process. Therefore this environment needs segregation of one user group from the other. Let us imagine there is a wholesale ecommerce scenario where we have a variety of user roles which requires a different level of access to the database. If the solution provider incorporates security features to implement granular user roles, audit logs, separate vendor dashboards in case of a marketplace environment it becomes easier to assign different roles to different user groups without compromising the security of the complete database. B2B ecommerce solutions should also offer the functionality of restricted login based access to the clients. This feature not only helps in offering unique pricing and deals thus maintaining the confidentiality but also allows to restrict purchases from clients or locations that are not considered safe. Whatever be the size or type of an ecommerce business, simplified and hassle-free shipping is its core requirement. Streamlined shipping has been a challenge for wholesale businesses where large volume orders need to be shipped not only to the clients but also to their warehouses located in various business territories. B2B ecommerce clients prefer a partner that can ensure speedy and damage free delivery of goods. Hence, every wholesale business should look for a platform that not only offers tools and features to run the business but also offers integrated shipping that can serve domestic as well as international customers. The shipping channel should preferably be automated that can deal with bulk orders and cut short manual intervention for printing labels and organising pickups. An integrated shipping network that offers discounted rates of shipping along with wide coverage and timely delivery can help in achieving a high customer retention rate thus giving a boost to your wholesale business. Despite having a host of B2B ecommerce platforms in the market it is really challenging to find all the above features in a single solution. StoreHippo ecommerce platform has worked on this and offers a comprehensive B2B solution with all the above features to help wholesalers maximise their ROI. Looking to explore these features and know more about the StoreHippo platform? Book a demo right away and allow our team to take you through all the amazing features that will give a winning edge to your wholesale business.